I’m obviously an advocate for reading. But if there’s one takeaway from this post, it is this: You don’t have to read 70 books to live a good life. Not 50, or even 30. This is not a post on the glorious benefits of reading, trying to get you to read more like Warren Buffet or anything like that. You can find plenty of that already on the interweb. It’s also not about how 70 books can transform a bookworm into a butterfly, happily ever after. Instead, it’s about the lessons I take away from reading that much so that, maybe, you don’t have too. 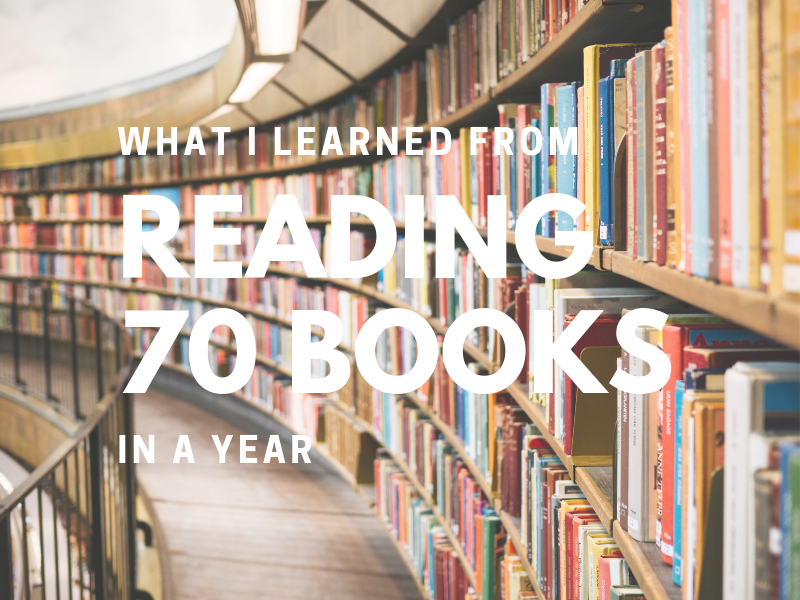 While my annual reading list has been consistently long—about 40-50 books each year—something different happens when I hit 70 in 2018. This post is specifically about that increase, what I learned about myself, and about the books I read. My reading diet is quite omnivorous. I’m a nonfiction reader for the most part, covering biographies, memoirs, essays, self-help, business, psychology, social issues, and current events in my selections. In the last few years, however, I added fiction (after not reading fiction for a long time) for entertainment and respite from the more serious reads. I love me some thriller and mystery to get lost into. But also, some of the books that have moved me most powerfully have been fiction. A comment on reading goals: Being someone who’s very number focused, I deserted reading goals a while back and switched to more qualitative goals, like studying certain topics, read more international authors, etc. I enjoy this approach more, since my interest will naturally drive the reading speed. I report happily that the 70 books, a personal record, happened naturally. To see all the books I read in 2018, click here. And to see which ones are my favorites, click here and here. So now that I’ve stated my data source, here is my analysis on what I learned from reading 70 books in a year. As I read in rapid succession, it becomes clear to me that I can gauge my level of excitement or weariness around certain topics or genres. This level of excitement clarifies the kinds of books that appeal to me the most. My favorite kinds of books are those that talk about social issues, fiction and nonfiction, that concern themselves with the issue of a more just and equitable world. They are usually the most informative—covering topics that I may have never been aware before—and they stir up the conscience toward being a better human and citizen. I don’t get tired of these books. In fact, reading one fuels interest to delve even more. The Understanding Poverty reading list and series is an example of this. This point in itself is not entirely new to me, but it is new in contrast to the next point, the genres that are now less important on my list. In contrast to the previous point, genres like business and self-help books get tiresome when I read a lot of them back to back. They may be great and exciting had I spaced them out more, but when read close to each other, they become trite, repetitive, and empty. The “shouldness” of it all is so tiresome. And puhleeasee…enough with the patronizing tone already. Part of the fatigue is from information gluttony. It is so rare to be able to implement much from these books, hence the knowledge overload. The other part is my growing skepticism over narrative bias. Did the authors include examples that only support their argument, or did they investigate counter examples too? Are there other explanations for the same examples? Are the principles gleaned from the case studies really the right conclusions? It’s not to say that the authors do not do the research. It’s just at the level of popular books, as opposed to academic literature and data-centric research, it’s hard to say. The academic in me often wants to do the cross-literature review, curious about the landscape of the arguments from various schools of thoughts rather than the single explanation in one book. I suppose the way to phrase these first two points is that I prefer books that make me reflective over those that propose actionable items, books that touch my “being” rather than my “doing”, so that the doing eventually will come from a deeper inner transformation and not a simple hack. Just because I read a book and am captivated by it, it doesn’t mean I have to follow its suggestions. I don’t have to believe or be convinced of everything I read, just because the author is some big name who is well established. I think it is good to suspend judgment when it comes to business and self-help books. Wait until you have investigated further and read alternative views around the same topic before coming to conclusions. Why? First, not all ideas are right and true. As in the previous point, you have to ask the question, does the author glean the right principles from the data presented? Try to poke holes in the argument. Second, not all of them are right and true for you and your situations. If you see an idea that stands out, test it first. Does the proposed principle hold true all the time? Or is it true just in specific circumstances? What are those circumstances? What are the exceptions? Knowing the limits of an idea—when it applies and when it doesn’t—is the practical wisdom to be gained here. When you find an idea that has been tested in multiple situations, applications, geography, disciplines, and over a period of time, you’ve struck gold. I think life lessons are best learned from life stories: memoirs, biographies, and longitudinal narratives of someone’s life or an organization. They are closer to the raw data of life. Life is complicated. It can be contradictory and ironic; it can’t be nearly parsed and packed in narratives of concepts. Cause and effects can be blurred. Some things we see as negative experiences may turn out to be positive, and vice versa. The more I read, the better I can decipher the structure of the argument in many nonfiction books. The benefit of this skill is increasing my grasp of the books over a shorter amount of time. Skimming better is an important skill, especially for students, since some books, while having good messages, are written with so much fillers. Seeing the key arguments in the midst of the supporting stories will save time without losing the book’s essence. In addition to skimming better, I’m also better at ditching books now! If it’s not engaging or convincing, I can now stop myself and break up with the book. This is a new skill for me. Ideas don’t live alone. Authors don’t live alone. They talk to each other, if not in person, within their body of works. They also network and tap into each others’ work. Mapping ideas is good in two ways. First, it helps develop my personal understanding of the concepts further. Which ideas are built upon other ideas? What ideas were new at some point, then become more mainstream over time? Second, it also helps identify whether an idea is independently corroborated by multiple people, or just being repeated and quoted by multiple authors who don’t necessarily test them in a new way. If the former, then it’s worth taking. If the latter, then don’t be convinced too quickly. There’s a lot of hype with reading these days. Reading has become quite trendy, which is fantastic. But I don’t necessarily think that everyone should read 40-50 books each year, unless it’s enjoyable. Engagement is more important than numbers. And the quest is to find books that can be wells of wisdom for your life. So in short, I’ve become a more selective and critical reader as a result of reading 70 books in a year. I hope some of these lessons can inform your reading too. And if you don’t agree, please comment! What lessons did you glean from last year’s reads?